My self care of choice these days is taking time to sew. It took me about 5 years and 2 1/2 kids before I realized that I absolutely needed to make time to sew and create, and that making time to do something I love wasn’t selfish; it was a necessary part of this beautiful dance called life, and without it, my dance steps were more of a heavy trod than a light leap. When we’re all lightly skipping and twirling, everyone is much happier than when mommy is stomping and dragging her exhausted, grumpy self around. Even since coming to this realization, I still struggle some weeks to set aside time for me time and self care, especially when there are deadlines looming. 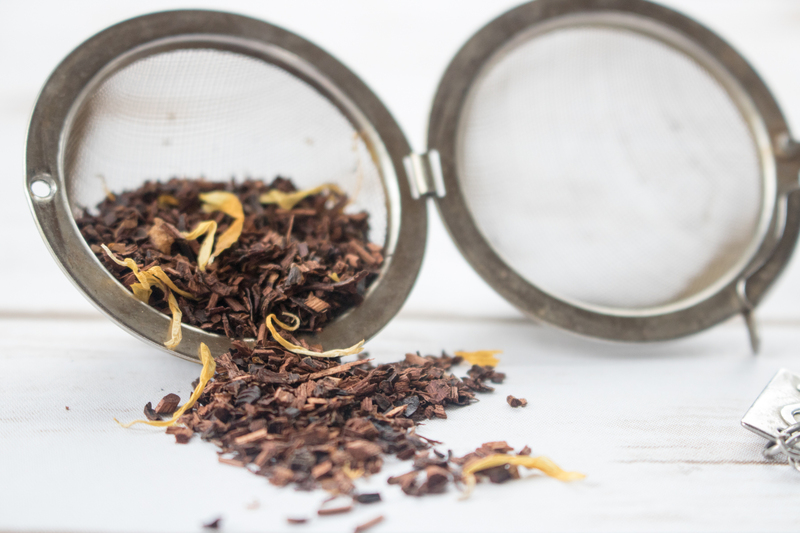 A while back, I was in the thick of a few looming deadlines when I received an email from Andy at Plum Organics Tea Company asking if I’d like to try some of their tea and review it on my blog. In perusing their site to see if it seemed like something I would enjoy, and more importantly, something relevant to this space, I discovered their Self Care blend. I also found myself immersed in a world of inspirational quotes, encouraging mantras, and soothing encouragements to take time for oneself. Relevant? I think yes. Full disclosure: Plum Organics provided two packets of tea in exchange for my honest review on my blog. All opinions are always my own. My gratitude for Andy’s timely email and the resulting realization that I needed more focus on self care is also fully my own, and huge. 1 – Create just for the fun of it. No purpose. No end goal. Just make. Especially with an endless stream of quilty requests, whether for the next baby quilt for a family member or friend, a graduation quilt for a cousin, teacher gifts for your children’s teachers, or business related quilting, the list of quilting “needs” rarely, if ever, ends. Despite this–or because of this!–it is so important to create for the sake of creating. I’ve recently joined in with the Girt by Sea sew along led by the Modern Makers Retreat and have been hand stitching the center medallion with some fabrics I won from Bari J a month or so ago (Sage fabrics for Art Gallery Fabrics). They are outside of my usual style and color scheme, it is a project with no end purpose or need, and it’s fun! Meticulous cutting, hand stitching, no stress or deadlines. That’s chicken soup for the quilter’s soul. 2 – Slow down and take time to sit. Drink tea. Hand stitch. Read. When it feels like there’s no way you’ll ever accomplish everything on your daily to-do list day after day, it seems like leisure is impossible. Yet, truly, what’s 10-20 minutes? 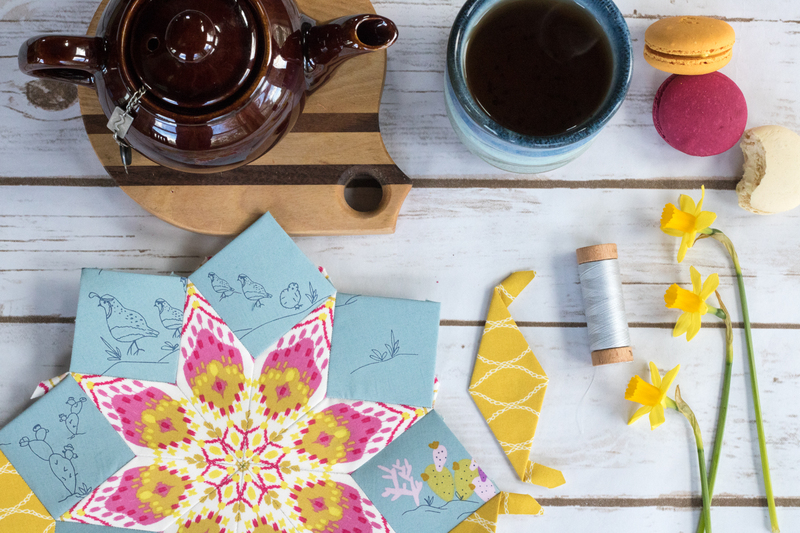 Take the time to sit, relax, drink some tea, hand stitch, read… whatever helps you fully relax. I’m a huge fan of English Paper Piecing (EPP) and the tiny meticulous hand stitching is meditative for me. Sitting down with a mini pot of the Self Care tea from Plum Deluxe with a sweet snack and my hand stitching, even if only for a few moments, can help rejuvenate and reset my patience level so that I’m better able to tackle the rest of the day. Try it! 3 – Take time for yoga, or simply stretch, move, and breathe mindfully for a few moments each day. Breathing is something that you do all day and night, but mostly likely rarely think about. Yet taking a few moments to be more mindful of your breath, notice the way you are sitting, and then sit a little bit taller, relax your shoulders, and take a few deep easy breaths can make such a difference in mood and how you feel physically. 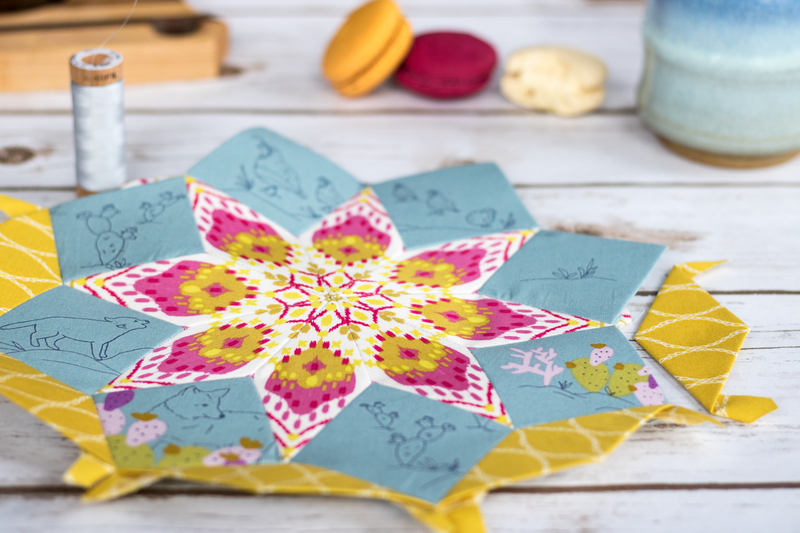 Especially when quilting or sewing, remember to take a break every so often, sit tall, breathe deeply, and gently stretch your arms, shoulders and back. Your mind and body will feel so much better! Even on the busiest day, I hope that this list will inspire you to take a bit more time for self care. Your mind, body, and family and friends will thank you! Now I just need to help myself take my own advice more often! 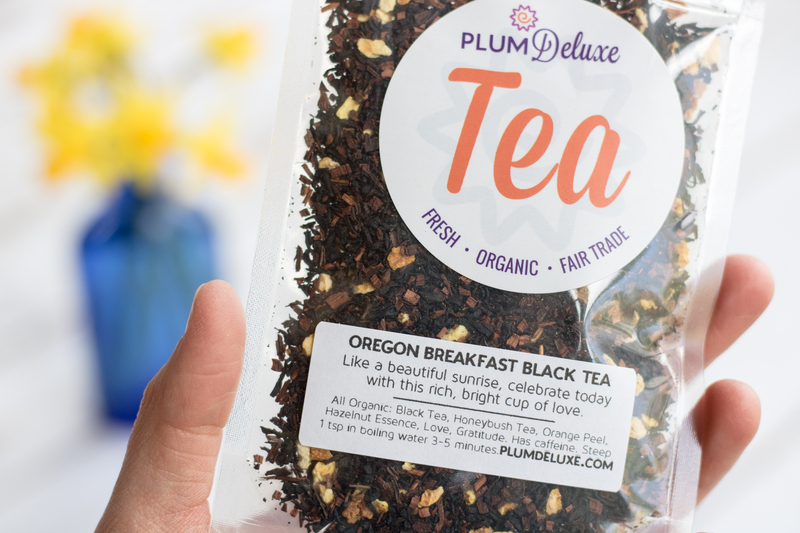 The first thing I noticed about Plum Deluxe when I visited their site was that their tea is organic, non-GMO, hand-blended, and fair-trade, all by a small independently run company out of Oregon. The focus of the company is community and inspiring people to live their best lives. Even their motto is: Making moments matter. I encourage you to read their About page; they are not your everyday tea company! 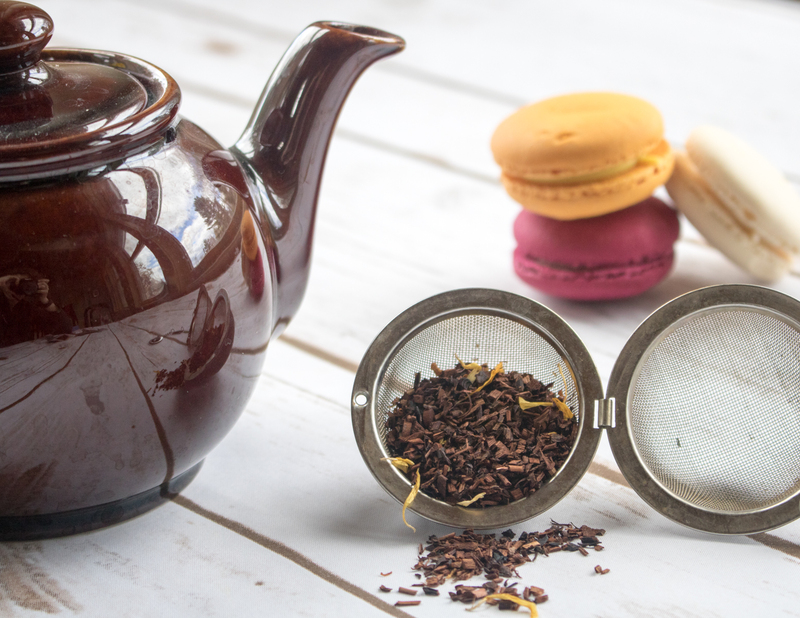 Everything associated with the tea is packed full of positivity–even the ingredients list on the tea states that the tea includes love and gratitude. That’s my kind of tea! The Self Care tea is fruity and delicious, and smells divine as soon as you open the package. I love loose tea, since seeing the actual components makes me feel like I’m enjoying tea straight from nature. Andy was kind enough to send me a package of the Self Care blend and a bonus package of Oregon Breakfast Black Tea, since I’ve been wanting to decrease the amount of coffee I drink and the Oregon Breakfast flavor is rich and robust. Not only does it have hazelnut essence, it includes love and gratitude. Mmmm. 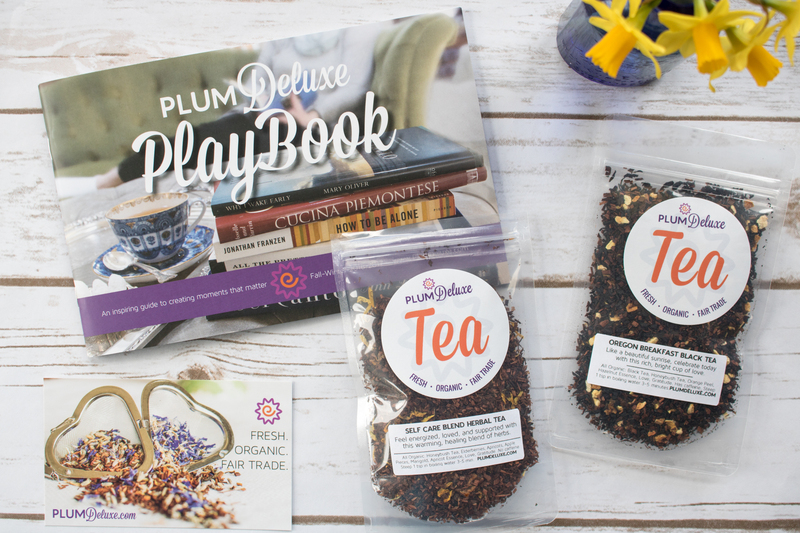 I mentioned that a big focus of Plum Deluxe is community; they also have a fabulous tea of the month club – for only $10/month subscribers receive 1 oz of a custom seasonally-perfect artisan loose leaf tea made just for the club. 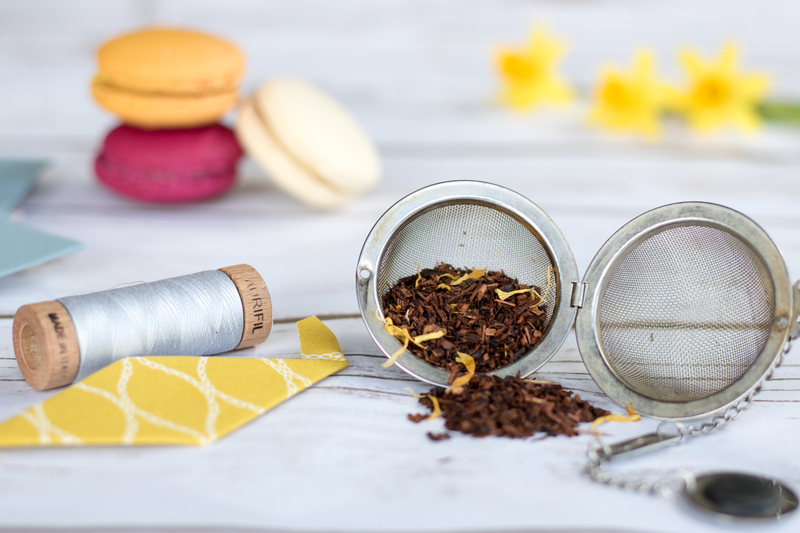 Subscribers also enjoy access to a robust and supportive private tea lover’s community, tea-inspired recipes, discounts on extra teas and supplies, and other surprises. They even host member meet-ups throughout the year, and several of their members host self-organized group events year-round. Andy was kind enough to offer my readers a free tea of your choice in your first month when you join the Plum Deluxe tea community. Be sure to tell him Kitty from Night Quilter sent you, and enjoy! I enjoy how drinking loose leaf tea forces me to slow the daily rush. The practice of getting out the loose tea and boiling the water allows me to slow down a bit, so that I can remind myself to breathe a bit more deeply, stand a bit taller, and chill out. With three kids under 8, I have to tell myself, insist to myself–chill out–quite often. In the grand scheme of things, this mess and chaos doesn’t matter. Everyone will be better off if I take a moment to breathe. Sip some tea. Have a snack. Stitch in a sunbeam. You know, that rare rainbow unicorn called self-care for (Mommy) quilters. I’m going to *try* to work the practice into my life a bit more often. I think we’ll all be better off for it.